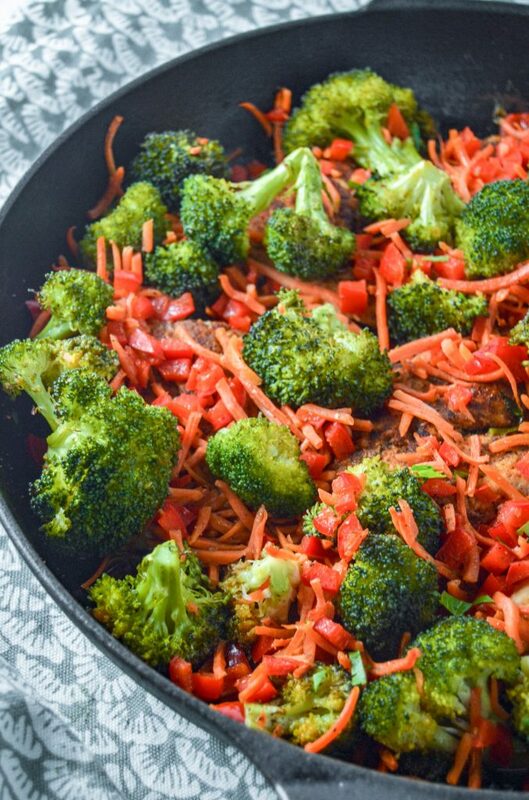 Chicken, Broccoli, Carrots and Red Pepper cooked together in a Cast Iron Skillet! Sheet Pan dinner are all the rage right now but a meal cooked in a Cast Iron Skillet is even better! Cooking in a Cast Iron is so versatile and easy. It is super easy to come home through everything together in 10 mins, put it in the oven and let it cook. This dinner is really easy. 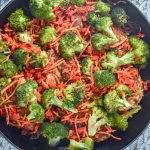 I use frozen broccoli and shredded carrots to simplify the prep. Then I just have to dice the peppers while the chicken is searing. Why sear the chicken? I think that it helps to lock in the flavor and juices while cooking. Heat the Cast Iron with some oil over medium low. While its cut the Chicken Breast in have and season. Once the skillet is hot add the chicken, cook for 3 minutes, flip, cook for another 3 minutes. 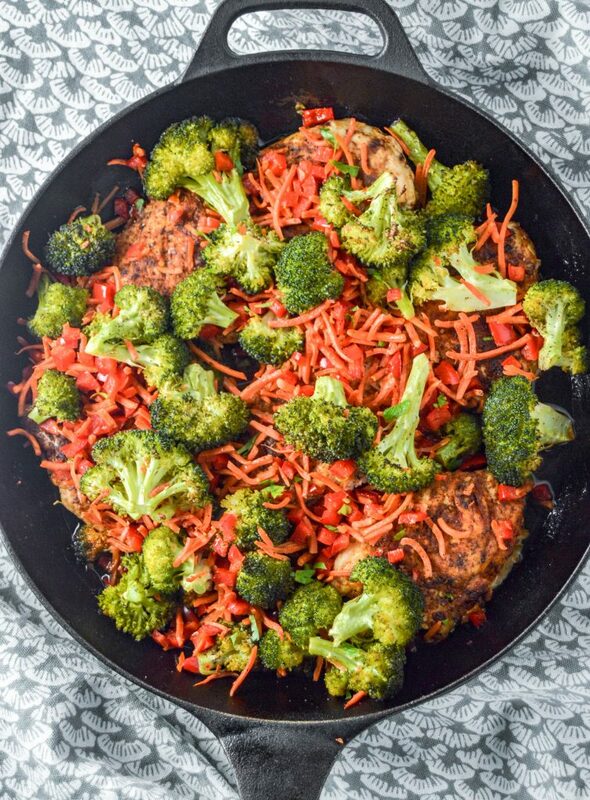 While the chicken is cooking dice up the red pepper, get out some shredded carrots (or chop the up) and grab a bag of frozen broccoli out of the freezer. You can use fresh broccoli if you rather. After cooking the chicken add the remaining ingredients. Put the skillet in the oven and cook for 30 minutes. After 30 minutes pull out and let cool. This dinner is really easy. 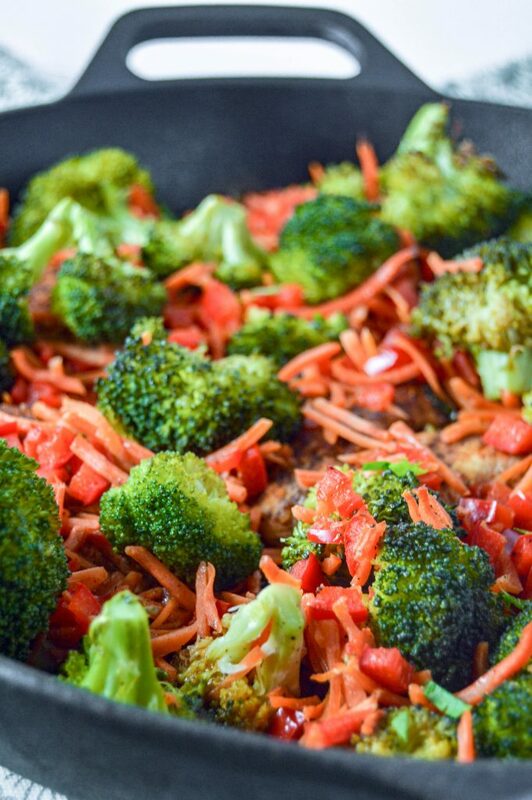 I use frozen broccoli and shredded carrots to simplify the prep. Then I just have to dice the peppers while the chicken is searing. Why sear the chicken? I think that it helps to lock in the flavor and juices while cooking. 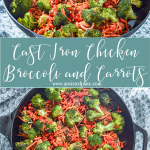 I hope you enjoy this twist to a sheet pan dinner! Cast Iron meals, a twist to the classic Sheet Pan Dinner! Note: This post contains Amazon affiliate links. What does this mean to you? It means if you click on a link and make a purchase, I will receive a small commission at no cost to you. Welcome to my little corner of the internet, my name is Meg! I started this blog simply as a way to share my twist on food and different kitchen hacks with family and friends. Most of the recipes on here are Paleo, Whole30 friendly and always Gluten Free!